Experience the beauty of Fitzroy Island from the sea on this day tour from Raging Thunder. Once onboard your kayak, this fully guided tour will take you on an unforgettable journey around the island and onto Little Fitzroy Island. Walk to the Lighthouse and enjoy the views, laze on the beach or snorkel the reefs and experience the abundant marine life of the Great Barrier Reef. Step aboard the Great Adventures fast catamaran cruise, for a unique reef and rainforest experience on Green Island in the Great Barrier Reef. 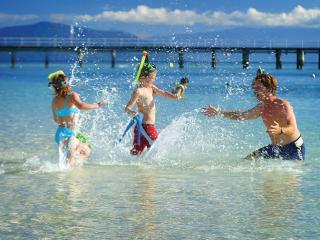 With up to 7 hours on Green Island, enjoy all the inclusions such as glass bottom boat coral viewing and snorkelling. Green Island is a beautiful 6000 year old coral cay and is gateway to the adventure playground of the Great Barrier Reef. Stroll through magical rainforest, laze on the white coral sands, swim, dive or snorkel amongst an amazing display of tropical fish and coral gardens. On this Great Barrier Reef day tour you will also have the choice of a glass bottom boat tour or use of snorkel equipment. Green Island is a beautiful coral cay on Australia's Great Barrier Reef. Green Island is a Marine National Park with unique rainforests, surrounded by white sandy beaches and magnificent coral reefs and abundant marine life. Guests can choose from Full and Half Day Tours and tours that include the semi-submersible submarine.